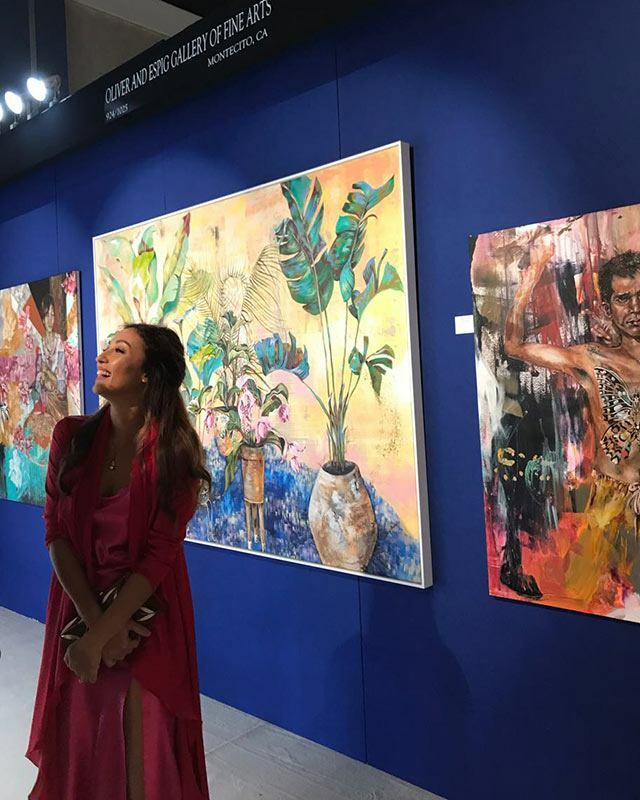 Earlier this February, Solenn Heussaff took a break from show business in Manila to focus on her art. The actress flew all the way to Florida in the US, where she debuted four new paintings under Oliver and Espig's gallery. She and her husband Nico Bolzico spent Valentine's Day at the Palm Beach Jewelry, Art & Antique Show to open the bright, nature-inspired collection to the public. Hi Solenn! Congratulations on the new show! How did the opportunity to join a show in Miami come about for you? "Glenn Espig, the owner of a gallery [in Florida] called Oliver and Espig, was introduced to me by my friend Jacques Branellec of Jewelmer, who also joins this show every year. He came to my house and viewed my Kalsada pieces, and then asked me to join [the show] under their gallery. An opportunity like it doesn't come twice so I accepted right away." Can you tell us more about the gallery? 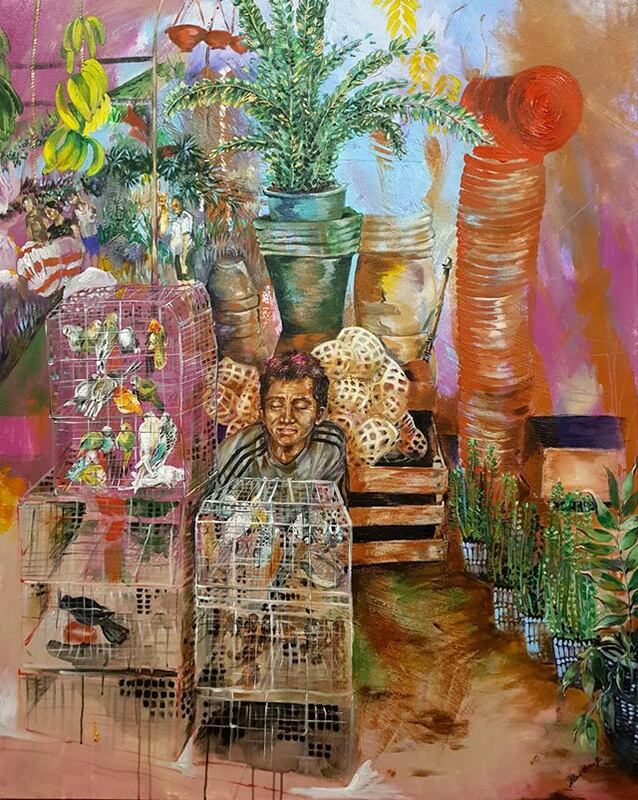 "The Palm Beach Show is a yearly art show for buyers and collectors, where they showcase everything from antiques, furniture, jewelry, to masterpieces and modern installations." What was your main inspiration and theme for the paintings you created? "I was only able to finish four artworks for this show, which are mostly based on surroundings and feelings. 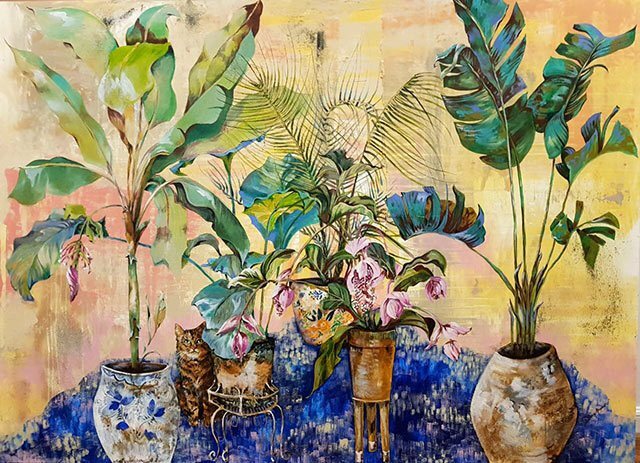 You can find more plants and animals on these pieces as opposed to just people like my other artwork. [My inspiration was about the] contrast and calmness [that] nature bring us." Is there a particular reason that made you choose this theme? "I started this theme because of a photo my photographer friend Eric Pascquier gave me, the one of two men. 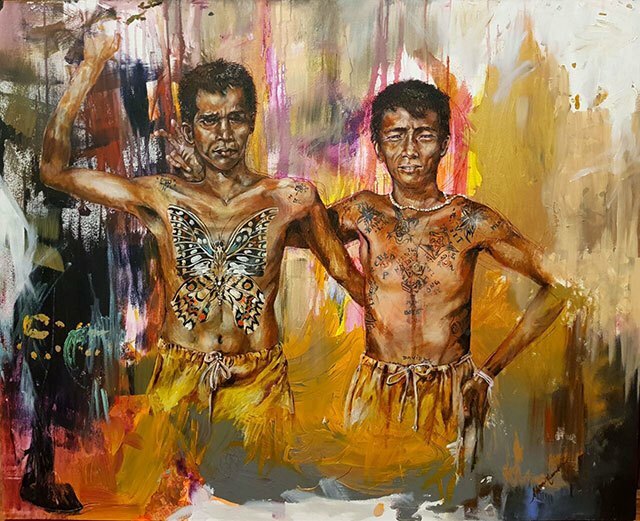 They are prisoners in Palawan that are given the 'freedom' to hunt for butterflies if they behave. This made them become the butterfly catchers of their prison. I just found the contrast [in this story] so perplex yet beautifully dark. "I also decided to use nature [as a theme] this time since we are all connected in it. We breathe the same air no matter who we are, what we do, or where we come from." In your previous exhibit Kalsada, you added a little bit of a twist by having your nephew help you out. Did you incorporate a special element like this or do something different in your new pieces? "My new pieces are still very colorful, though without the help of my nephew. This time, I used different techniques like rolling and palette knife. I also used more blues and pinks to fit the Palm Beach vibe." Where exactly is the show being held for those who want to visit? 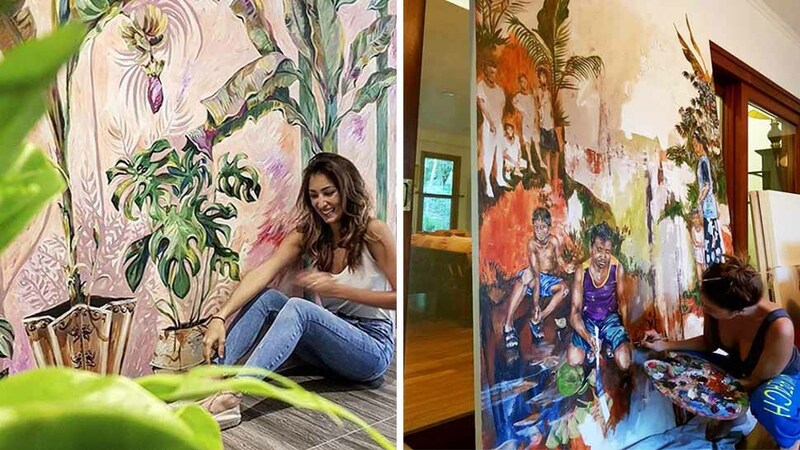 And will we be able to see these paintings of yours here back in Manila? "The show is being held at the Palm Beach Convention Center. 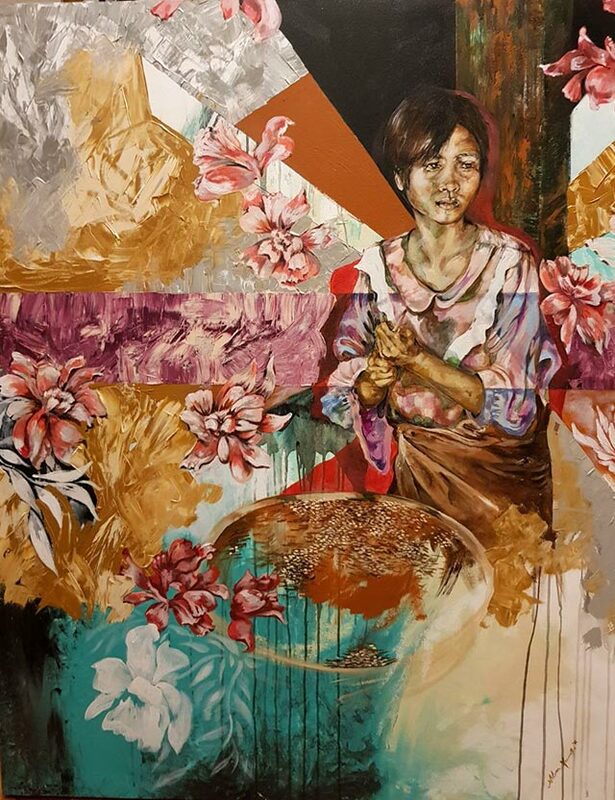 All the booths and galleries will be showcasing their artists from February 14 to 20. "These pieces will stay here in the States. I will be working on something for the near future, but no exhibit anytime soon. I want to focus on art as an education purpose and am working with Jewelmer on a program." 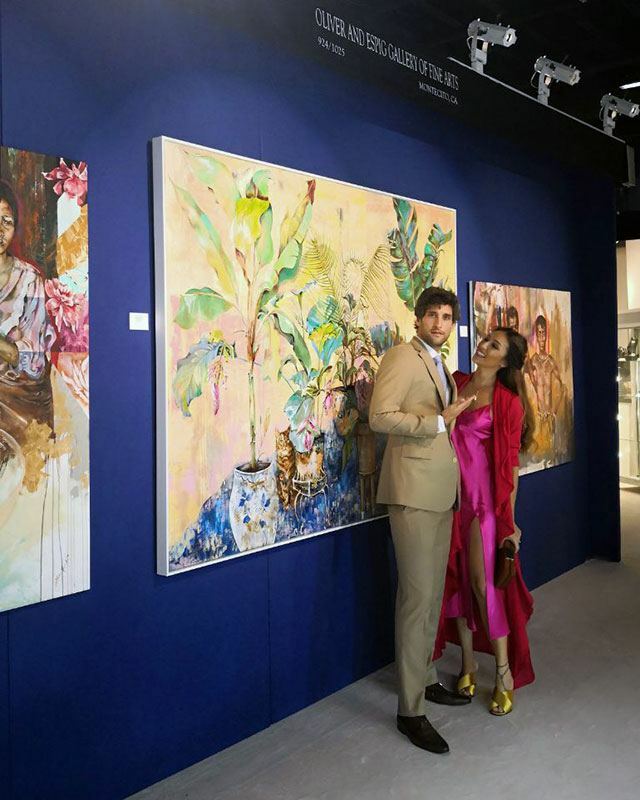 The couple poses for a photo with Solenn's paintings in the background. Beautiful work as always, Solenn!